Brisbane - All-rounder Shane Watson has suffered a minor calf strain ahead of Australia's first cricket Test against South Africa, which will prevent him from bowling in the series opener starting Friday. Watson limped from the field on Saturday during New South Wales' Sheffield Shield match against Queensland and scans have shown the 31-year-old strained a calf muscle. Australia's selectors were expected on Sunday to name standby players for Watson and veteran batsman Ricky Ponting, who has a hamstring strain. 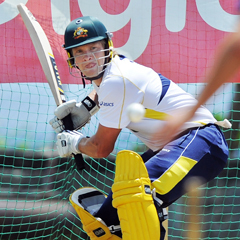 Captain Michael Clarke told reporters it was possible Watson would play the first Test at Brisbane's Gabba ground as a specialist batsman. Clarke said "fingers crossed, I'd love to see him fully fit and batting and bowling."